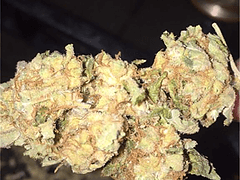 Khalifa Kush, also known more commonly as “Wiz Khalifa OG” among the cannabis community, is an indica dominant hybrid (80% indica/20% sativa) strain created as a descendant of the insanely popular classic strain OG Kush. The exact genetics of this strain are kept under lock and key, as it was bred specifically for Wiz himself by a dispensary in San Jose, CA. 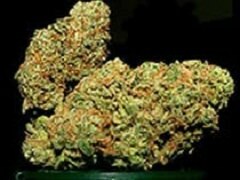 This dank bud boasts a powerful 24-27% THC level and insanely active and stimulating effects. This perfect wake-and-bake 6strain hits you hard with an intense cerebral activity that leaves you energetic and uplifted, immediately eliminating any feelings of fatigue or pain. This is accompanied by a relaxing mellow body buzz that leaves you completely relaxed in both mind and body without any feelings of sedation. Because of these powerful effects, Khalifa Kush is perfect for treating chronic fatigue, chronic stress or anxiety, mild to moderate cases of depression, and muscle spasms. 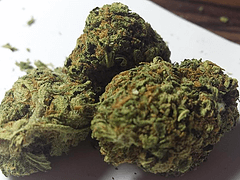 Khalifa Kush buds have small to medium-sized super tight forest green leaf-shaped nugs with a thick layer of fiery orange hairs and visible droplets of sticky resin. These nugs have a classic OG aroma of sour lemon pine with a taste of sweet and sour lemony pine with an earthy aftertaste.